If you want to improve your stickhandling and puck control you may be looking for something that will help you develop your skills off-ice. The MoveMaster hockey puck set is designed for this very purpose. We have already given you an in depth look at the product in our MoveMaster product overview, and we will now be testing the product out and giving you a full review. 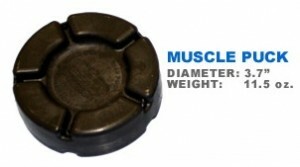 The MoveMaster hockey pucks sell for around $35. When you buy them you get three pucks, and each puck is specifically designed to help you in a different way. Let’s look at all three pucks, how they are designed, and how they actually worked. 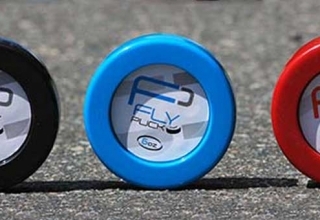 The Speed Puck is a teeny tiny puck that is very light. 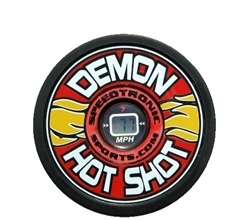 When compared to an ice puck, this puck is thinner, has a smaller circumference, and is also much lighter. 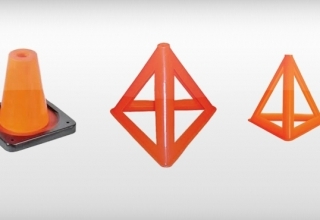 This puck was designed to help build the fast twitch muscles, and practice repetition. Stickhandling with this puck is a lot of fun, and much more challenging than using a regular puck. The smaller size makes it harder to control, and the light weight allows a player to quickly move the puck from side to side. We practiced with the pucks on a hockey shooting pad and on smooth pavement and they worked great. We found that they work the best on a smooth surface, so we definitely recommend a hockey shooting pad. After extended use there were only superficial scratches and light rubs on the pucks. We did not shoot the pucks at all because the packaging said that they are not for shooting. The two downfalls for the pucks would be the price and the lack of shooting capability. $35.00 is a bit pricey, but the way I see it, if you learn and develop skills, then the money is well spent. I remember buying a set of videos on how to stickhandle for $100 when I was 15, and I still use the moves I learned to this day. I love scoring goals, and I don’t miss the $100 one bit, so if you are actually going to use the pucks, then they are worth it. As far as shooting, I think the most effective approaches are using regular ice hockey pucks and the weighted hockey pucks with the orange rubber. In this video we show you the difference between the three MoveMaster pucks and compare each puck to a regular ice hockey puck. We also do a bit of stickhandling with each puck to show you how they work. The Movemaster hockey puck set retails for about $35, if you would like to buy them, or get more information you can visit the official Hockey Shot website.